Niagara Falls ON Canada offers many accommodation options. From quaint bed and breakfasts to luxury hotels, to get close to nature camping, we have it all. Our many hotels have options to suit any need you may have in hotel restaurants and spas; do you need pet-friendly accommodations or maybe a world famous heart shaped tub? We have it all. Embassy Suites By Hilton Niagara Falls – Fallsview Hotel located in Niagara Falls Canada, is the world’s largest Embassy Suites and has been rated each year the AAA 4-Diamond award. 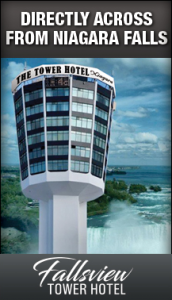 The hotel towers 42 storeys over the Brink of Niagara Falls – and is located only 100 yards from the water’s edge. 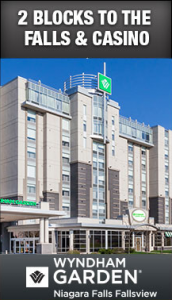 Located on Fallsview Boulevard in the Fallsview Tourist District – beside the new Niagara Fallsview Casino, the hotel is surrounded by Niagara’s finest restaurants and attractions and offers the finest in Fallsview accommodations. Let the Embassy Suites By Hilton Niagara Falls – Fallsview Hotel be your guide to Niagara Falls with great getaway packages that make planning easy. Plan a romantic getaway for two with the Romance Package, or a family vacation to remember with the Family Fun Package. This new and unique Niagara Falls Hotel provides guests with unparalleled Falls Views, spacious two-room Suites, two restaurants including Fallsview Dining in the Keg Steakhouse & Bar, Niagara Falls tours and unmatched service excellence. Visit our Site Map for additional Niagara Falls Vacation planning. Guests of the Embassy Suites By Hilton Niagara Falls – Fallsview Hotel can also experience the Falls without leaving the hotel! View Fireworks over the Falls from your Suite at the Embassy Suites By Hilton Niagara Falls – Fallsview Hotel over 50 nights a year! The Falls are also bathed in the colours of the rainbow with nightly Falls Illuminations. Call 1-800-420-6980 for more information. Planning a Niagara Falls Wedding? 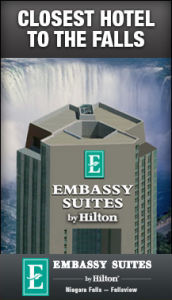 The Embassy Suites By Hilton Niagara Falls – Fallsview Hotel will help with all of your planning details! Imagine a Wedding Ceremony Overlooking Niagara Falls, in the Fallsview Wedding Chapel. Let the Wedding co-coordinators assist in planning the perfect day. Honeymoon Packages are also available. Call for details or visit Niagara Falls Wedding Services webpage. With so much to see and do in Niagara Falls – you will need more than just a few days. With a spacious 2-room Suite, and Complimentary Breakfast to start your day – the Embassy Suites By Hilton Niagara Falls – Fallsview Hotel provides location, value and a “suite” view of Niagara Falls! Connected to the Fallsview Casino by an enclosed walkway, this 18 storey hotel is located just 1 block from Niagara Falls. 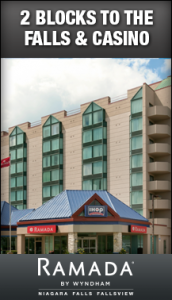 This hotel features Fallsview guest rooms, luxurious whirlpool rooms, indoor pool, 2 hot tubs, fitness centre, IHOP, East Side Mario’s and is located in the heart of the Niagara Tourist District. Hotel Packages make vacation planning easy! 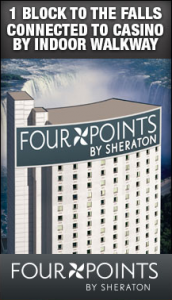 The newest 4-Diamond AAA hotel to join the Starwood family, the Four Points by Sheraton Niagara Falls Fallsview Hotel boasts 391 guestrooms which is located just minutes from the Falls. The hotel is connected to the Fallsview Casino through an indoor walkway which features table games, poker, slot machines, concerts, restaurants, Wedding Chapel, Night Clubs, shopping and much more. The hotel is also conveniently located within minutes of the Skylon Tower, Journey Behind the Falls, Maid of the Mist, and White Water Walk. Luxurious guestrooms include whirlpool suites, Fallsview and a Presidential suite. 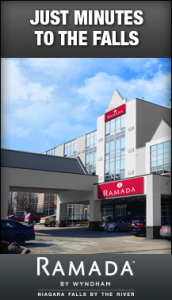 Ramada Hotel Niagara Falls is conveniently located just two blocks from famous Niagara Falls steps away from Niagaras popular Casinos! Better value cannot be found in the prestigious Fallsview District. 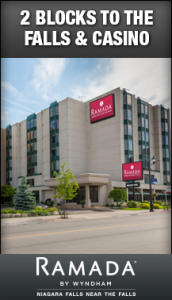 Comfortable, affordable accommodations featuring shuttle service to all Niagaras exciting attractions, Casinos, and of course Niagara Falls! 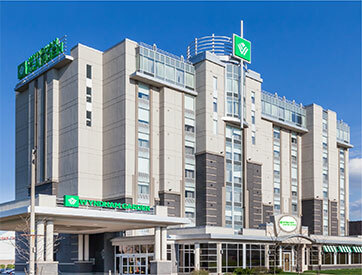 The AAA-CAA approved Best Western Fallsview is located across the street from Fallsview Casino and in the heart of the Fallsview Tourist District. Conveniently located just one block to Niagara Falls and its many attractions – Maid of the Mist, Journey Behind the Falls, Skylon Tower & more. 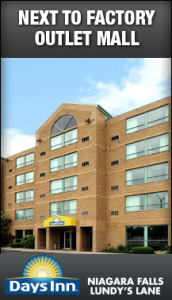 The full service 248 room Best Western Fallsview Hotel offers you proximity with value for your entire family. A truly amazing dining experience awaits you at The Keg Fallsview Steakhouse and Bar. Located on the 9th floor of the Embassy Suites By Hilton Niagara Falls – Fallsview Hotel, this restaurant offers the mouth watering steaks and romantic ambience you will find at any Keg Steakhouse, with a view from your table of one of the world’s most majestic wonders – Niagara Falls. Giant floor to ceiling windows allow a view of famous Niagara Falls from anywhere in the restaurant with three tiered seating and a large stone fireplace. The only other thing that competes for your attention are the great steaks.